Canada often gets overlooked as a golfing destination but if you do, you do so at your own peril. There are tremendous Top 100 courses in Canada but beyond the rankings there are numerous golf courses that seem to offer fun challenges to golfers in fantastic natural settings. Plus Canada has my three favorite things moose, maple syrup and hockey so really it is the complete package. Over the last few years I have become enamored with one area of Canada in particular, Vancouver Island and the city of Victoria. Vancouver Island is surprisingly temperate weather-wise, meaning when the mainland is getting socked in by months of snow, you can still golf there and the golf courses look fantastic. Also, Alaska Airlines flies 4 flights a day into Victoria so it is easy to get to whether you are on the West Coast or the East Coast. Bear Mountain (Mountain): Jack Nicklaus is a prolific course designer but I dare say he hasn't crafted too many courses prettier than Bear Mountain. Somehow Jack and crew managed to wedge this course on the side of a mountain providing amazing views of the surrounding island. The PGA Champions Tour knows a good thing when it sees it and has an annual tour stop here. The resort associated with the golf course is top notch and the Golf Trail offers stay and play packages so you can live the good life with a good course. Highland Pacific Golf Course: Victoria is a beautiful looking town and is probably where I will be spending most of my time when not golfing on the island. Just outside of town is HPGC which was a course that was a real family affair. Herb Plasterer wanted to build a public golf course and started down the path but died. His wife Rose and his family carried on and the course came into being and looks absolutely stunning. I love courses molded by iconoclastic designers like Pine Valley and Pebble Beach and this course is much cheaper and much more accessible than those ones and I can't wait to see what Herb and Rose got up to. Arbutus Ridge: Golf courses live in their environment, that is just part of the deal. Arbutus is a beautiful looking golf course that is surrounded by 9 wineries and not only that, it has a certificate in environmental planning. This land is gorgeous and the golf course only enhances the beauty of the terrain. WestJet! Magazine named this course one of the best values in Canada and I look forward to seeing why. Victoria Golf Club: A private course on VI, and not on the official golf trail, VGC warrants special mention because of my obsession about it. The course was founded in 1893 (second oldest in North America!) is often ranked in the uppermost reaches of Canada courses and if I could be a member of any course in Canada, this would be the one. Numerous holes by the ocean and also fantastic parkland holes, this course seems to have it all. The clubhouse is a historic landmark but from what I understand about it, the club has a great, laid-back vibe. It would be a honour (Queen's spelling) just to play there and definitely on my top 10 "must play" list. So there you go, a deep dive into one of the unheralded golfing regions in the world, Vancouver Island. Have you played any of the courses there and/or have done the golf trail? Let me know in the comments and if there are any I need to play tell me! 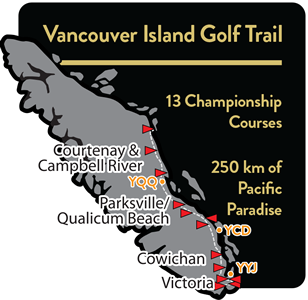 Images are from Golf Vancouver Island and are used for news and commentary purposes only.